Instead of bitching for 1200 words about how unwatchably terrible Valerian And the City of a Thousand Planets was (and I wanted to like it! I tried SO HARD to like it!) I will instead point you in the direction of this love letter to Luc Besson’s masterpiece The Fifth Element. I was finishing high school when this movie came out, and I’ll admit, I was just a smidgen obsessed with it. I still remember the vague promos that came out months ahead of this movie. They didn’t say anything about what the movie was about, or who was it in. Yes, I was a very impressionable teen, but wow those promos made an impression on me! I had no idea what this movie was going to be about, but I knew I had to see it. When the movie finally came out, I’d never seen anything like it, I didn’t know movies like this could exist. I had no idea if I was watching a movie, or a music video, or both at the same time. Great art direction, fun set design, fun soundtrack, great aliens, snarky script, and it is even more over the top than Baz Lurhmann’s Moulin Rouge. 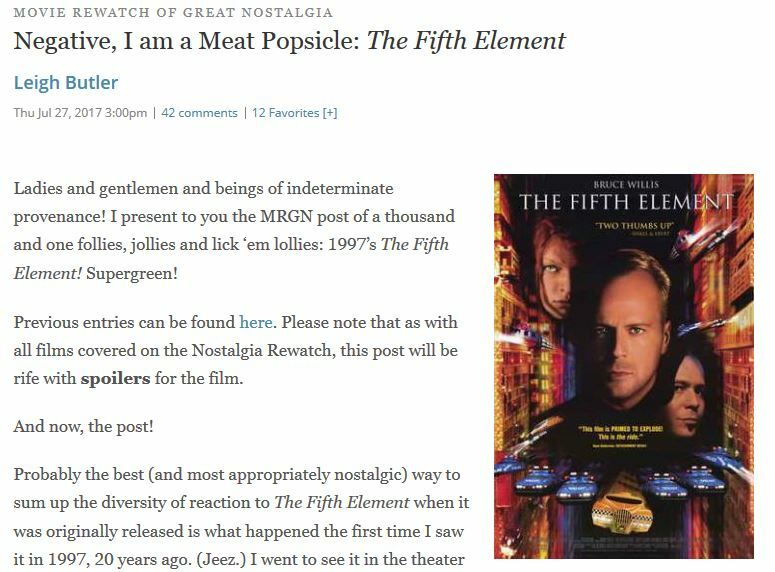 If you can believe it, there are people who have never seen The Fifth Element! What would you tell someone who has never seen this movie to get them to see it? 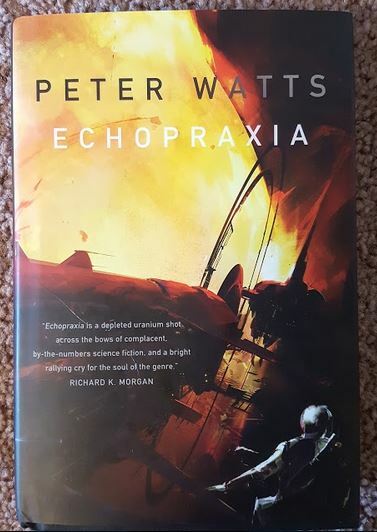 How would you convince them that this 20 year old scifi flick is worth their time? Have you never seen Doctor Who but you’re curious to know what all the fuss is about? 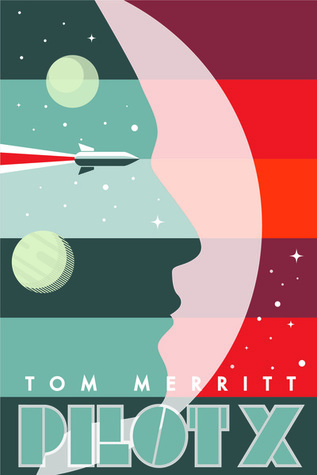 If you answered Yes to either of those questions, Tom Merritt’s novel Pilot X might be for you. I say “might”, because there isn’t much to Pilot X, and if you go into looking for deep characterization or a memorable plot, you’ll come out disappointed. 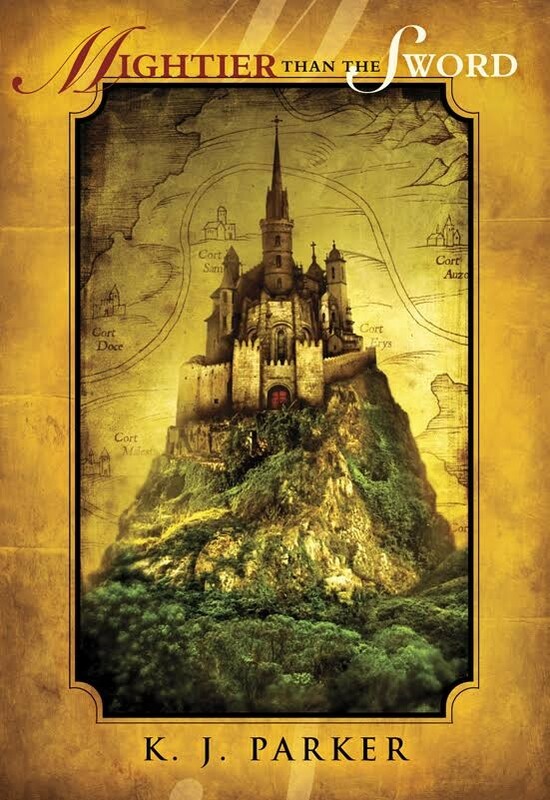 This is a weird little book to review, because plot and character wise, there isn’t much to it. But there are these fun little other things going on that have nothing to do with X’s story that I enjoyed. There is a lot under the surface of the text, and had Merritt explored and expanded on what lies just under the surface, the style of this book would have been very, very different. I think the trick to enjoying this novel is knowing what it is, and knowing what it isn’t. X is a time traveler. He starts out as an apprentice, becomes a pilot, and holds other titles during his career as well. In his culture, everyone has a unique name, with their “first name” being their title or occupation. He was born the first year that single character names became allowed. (Fun thing number one: does the length of someone’s name tell you what era they are from?). This is a society of timelords time travelers, so it’s easy for X to go on a mission that might take him weeks or years, and be able to report back to his superiors twenty minutes after he was given the assignment. As first, I was annoyed by the episode nature of the plot of the book, and much of the actual missions that X goes on were rather forgettable. (fun thing number two: This is a non-linear story, so the episodic nature actually makes some sense. When you’re a time traveler, does the order in which things happen even matter?) As X gets more missions and spends more time with the man who gives the orders, he starts questioning if he’s actually on the right side of the Dimensional War. X doesn’t even know if he’s made contact with a secret operative or not. If he is successful in his final mission, he will be the only survivor of a race that has been erased from memory. Short stories – anthologies, collections, magazines. Yay or Nay? I used to struggle with short stories. I had no idea how to read anthologies. How hard could a themed anthology be, right? I’d overthink the entire thing, and make myself miserable. I’d finish stories I didn’t enjoy because some part of my brain was telling me that these stories were chapters in a larger universe, and if I missed the end of the story, I’d have missed some important plot point. No wonder I didn’t get it! For the life of me, I could not understand why anyone thought short stories were worth a damn. Luckily, I finally my hands on some anthologies that weren’t crap, and I came across some fantastic single author short story collection, and I found some fantastic short story podcasts (if you’ve not listened to Kate Baker tell you a story, you are in for a treat!). Also? that table of contents? I completely ignore it. The editor spent days or maybe weeks putting that table of contents together for goodness sakes, they are telling me something with that table of contents, I should respect their message, right? The first time I realized I could read an anthology in any order I pleased was a revelation. Since then, I’ve been reading the shortest stories first, and working my way up to the longest stories. Or, I’ll read the interesting sounding titles first. Or I’ll read my favorite authors first. If I read two or three short stories and I’m still “meh” on the whole deal, I’ll probably put the book down and never pick it back up again. What I’m getting at is that when I started allowing myself to have control over how I read an anthology and read it however I damn pleased, I started enjoying them a lot more. Sorry editor, all your work on your perfect table of contents was wasted on me. Can I buy you a drink or dinner when I see you at a convention, to make it up to you? How about you? Are you into short stories? How do you imbibe them? Anthologies? single author collections? short story magazines and/or podcasts? If you’re like me, and you used to struggle with short stories, how did you get past the struggle? Celia makes it look easy, but she’s been training so long to break records that to her, all the training has begun to feel hum-drum. She figured out the trick to conditioning her body years ago: all she has to do is suffer, and the hardest part of breaking a record is the unceasing boredom. Most minutes holding your breath under water, longest time being buried alive, most number of hours spent without sleeping, she’s done it all and she knows it’s 99% sitting around waiting. She’s lived in Record City for as long as she can remember, and for nearly as long she’s lived with her adoptive parents and a few house mates. They eat together, train together, cheer each other on, and help each other recover. When the team breaks a challenging record, it’s cash rewards all around and better housing. Losing out to another team means having to move to a dingier apartment with fewer windows. It might sound weird to you and I, but to Celia this is what family and love and friendship means. When you’re surrounded by people who live their lives the same way you do, there isn’t anything to tell you that this is all very weird. 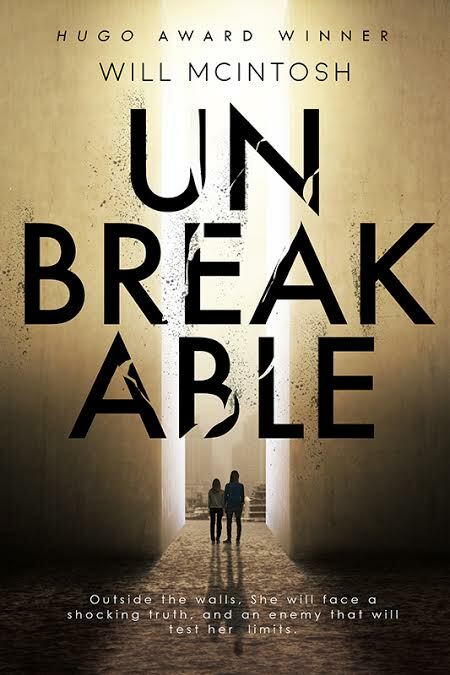 Part Hunger Games, part Lost, and part other things I can’t mention because I don’t want to wreck the twist, Will McIntosh’s new novel Unbreakable will grab you by the neck and won’t let go. 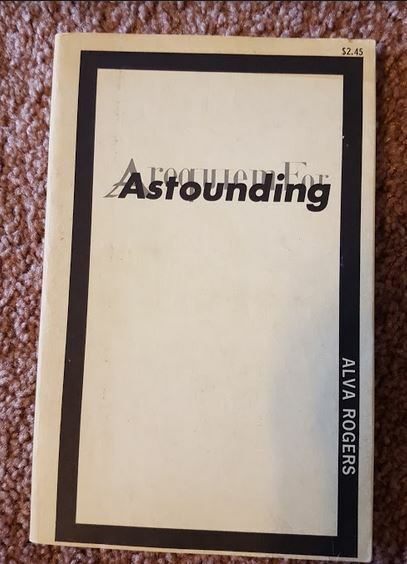 Longer than a novella, but shorter than a novel, McIntosh self published this very strange, ultra fast-paced, narrowly focused, and addictively readable novel. It is currently available as an e-book or paperback on Amazon. As a friend lies dying, Celia escapes Record City on a quest to find a life saving medicine she’s heard about on television. And what she finds are . . . more walled cities full of single minded citizens who shush her every time she tries to ask questions. Even in Record City, the rule was “follow the rules sand shut up”, and the TV and movie characters who inspire Celia to be curious about the world were bound to get her into trouble eventually. I was intimidated to read this book. I doubted my ability to “get it”. What if I read and said “ok, that’s nice”? What if I didn’t understand the author’s intent? Endless doubts and what if’s. 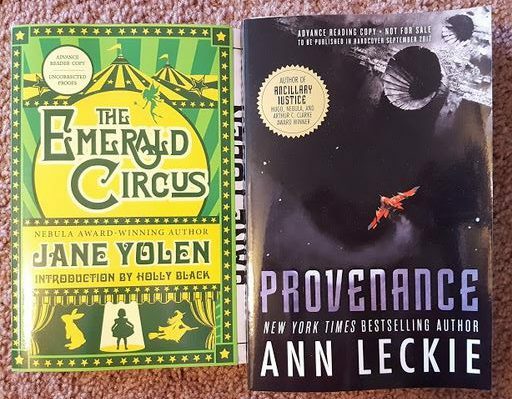 At my local book club a few months ago, instead of having us all read the same book, the club organizer put a stack of Hugo winners on the table and told us all to pick one. I grabbed The Left Hand of Darkness off the table. Doubt can go screw itself. The big idea in The Left Hand of Darkness is how would culture and society be different if there was no gender? Unique among the planets that support human life, the people of Gethen have no fixed gender – they are neither male nor female, and have the ability to both father a child and give birth to a child. These people have never heard the phrase “traditional gender roles” and sexism and gender bias don’t exist in their culture. In their language, the pronouns “he” and “his”, simply mean “person”, and titles and offices that sound male to our ears are inclusive. This book is full of “he” and “his”, but there is only one male character in this book. Genly Ai, Envoy of the Ekumen, has travelled to Gethen to invite the planet to become a part of the Ekumen, which is an interstellar trade federation of sorts. He has now been residing in the kingdom of Karhide for over a year, and he will stay until the planetary leaders voice their wish to join the Ekumen, or until they tell him to go away (them killing him might also happen). Genly is in some ways incredibly patient, but in other ways impatient. Not only does he not in anyway understand the local politics, but he also struggles with the idea that his hosts are not men and not women, but potentially either, and always showing traits of both femininity and masculinity, often at the same time. In return, they view him as a sexual deviant, a genetic freak. Gethen isn’t just a planet of no fixed gender, it’s also a planet that is actively trying to kill you. Nicknamed “Winter”, this is a place of never ending ice and snow, with a narrow band near the equator that can support life. No large mammals, no birds, no apex predators. 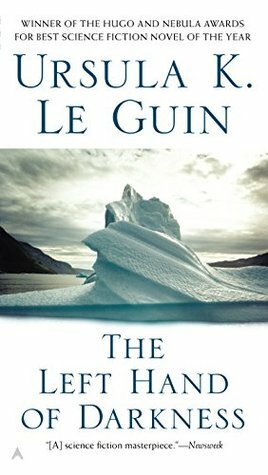 LeGuin does magic with how the planet shapes the society and culture of the Gethenians – no birds to be curious about means no interest in airplanes, no large animals to eat means many meals and snacks during the day and strict rules of socializing that revolve around eating. On a planet where frostbite can kill, hospitality towards the stranger is the norm. On a planet where the populace appears to have no fear or distrust of the “other”, there are plenty of arguments, but there has never been an all out war between Karhide and their bureaucratic neighboring country Orgoreyn. Sprinkled through the novel are interim short chapters that include both local folklore and helpful commentary from anthropologists who visited before Genly.